Thunder Glass Press, 9781941300015, 370pp. Darcy McClain has discovered unbelievable atrocities hidden deep within the basement labs at Los Alamos, and she can't escape . . . Former FBI Special Agent Darcy McClain and her sidekick Bullet, a giant schnauzer, are in Taos, New Mexico, when they stumble upon a flash drive in an arroyo on the property she's inherited. The drive belongs to Los Alamos National Laboratory (LANL). Darcy pockets it and hikes to the adobe on her land. There, she finds a pregnant teenager, Rio, searching the house for the drive, since it's a possible clue to the whereabouts of her missing fianc Johnny, who works at LANL. Rio is frantic to locate him. In a strange coincidence, Darcy learns Rio is the daughter of a family friend, and bound by this bond, she agrees to help the woman find Johnny. 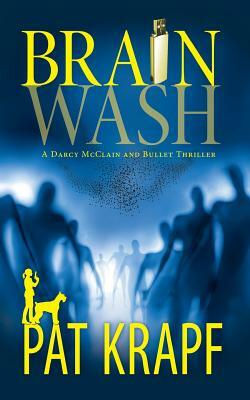 What begins as a missing person's case soon escalates into a dangerous game that places Darcy's life at stake after she slips undercover and infiltrates the top-secret biotech labs at LANL, where shocking neuroscientific research soon comes to light. Pat Krapf was born in New Jersey, but spent her formative years overseas and is still a globetrotter. She worked in advertising and marketing for the health care, aerospace, and architectural industries. She left the corporate world to write the Darcy McClain thriller series. She lives in Texas with her husband and Giant Schnauzer.